Since 2014, students at Abraham Baldwin Agricultural College in Tifton, GA participated in a walk from West Point, New York to Dallas, Texas, to remember, honor, and celebrate our nation’s heroes. 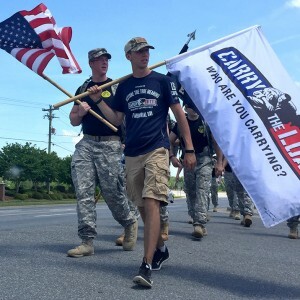 The walk was sponsored by Carry The Load; a non-profit organization whose mission is to connect Americans to the sacrifices of our military, law enforcement, firefighters, and rescue personnel. Gayle and I are excited about participating in the East Coast kickoff. We will be tailgating at Fenway Park prior to the Red Sox Yankee’s game in May 1st and walking the first leg of the relay with the Carry the Load Team. I would like to encourage you to participate. Between April 27 and May 29 , 2016 this year’s relay will cross the country and cover over 6,600 miles. Two teams will march one from Boston, MA and the other from Seattle, WA. They meet in Dallas TX on Memorial Day for the national rally. There is no fee to participate. I hope you will join us and the thousands of individuals across our nation in walking to honor our military men and women for the sacrifices they have made for our freedom. Participants in the walk are encouraged to form teams to walk in respect for the fallen, and also to fundraise among friends, families, and coworkers. The walk will also receive local and national media attention in your market. Donations are secondary to the mission of Carry the Load, however, any monies raised will go to support one of 17 non-profit organisations. A full list of those can be found a carrytheload.org.